St. Sofia Cathedral in Tobolsk. Within the Kremlin in Tobolsk. Stairway leading from the Kremlin to the old town in Tobolsk. 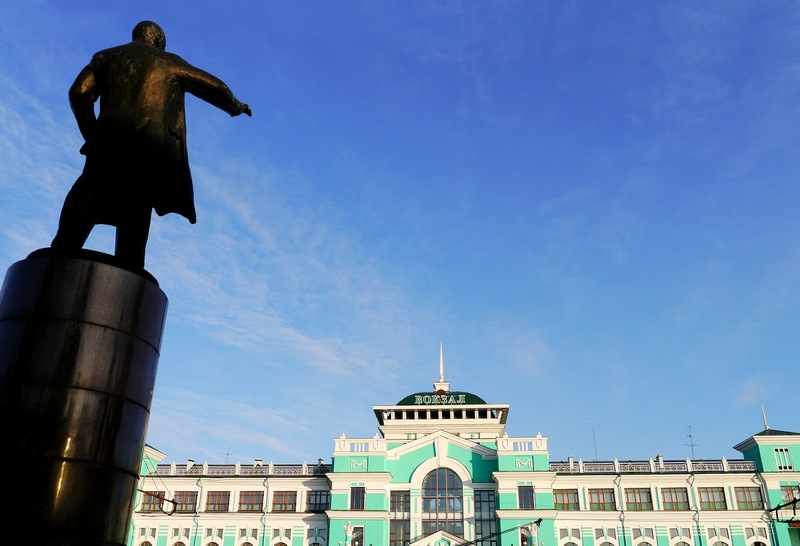 Lenin statue greets arriving passengers at Omsk train station. Omsk train station with it's massive chandelier. We left Perm at 10pm, slept on the train and arrived in Tobolsk in the early afternoon. In the morning we were questioned by some very tan Russians in very broken English about why we were going to Tobolsk and why we were in Russia at all. They repeatedly pointed out that they had flown to Dominicana while we flew to Rossiya. Finally the man (who spoke no English) gave up and just said "You crazy". We agreed, but decided not to point out that he was the one that lived here. Tobolsk is the former capital of Siberia, and has a very pretty kremlin, the only stone kremlin in Siberia. To get to the town center from the train station the bus drives through 10 km of industrial buildings and soviet-era apartment blocks. The kremlin was quiet, save for a few bus loads of children on school trips. We walked down some wooden stairs to what the guide book called the "wonderfully dilapidated" old town. I should mention we don't have the latest edition of the book so some of the research is 5-6 years old. We initially came upon the kind of condo development that goes up in every western city. We persevered and made it to a few abandoned and crumbling old wooden buildings. There were some homes that appeared to be inhabited, but most were listing to the side and sinking into the ground. I think the dilapidation is probably not so wonderful when you can't keep things on the shelves anymore. 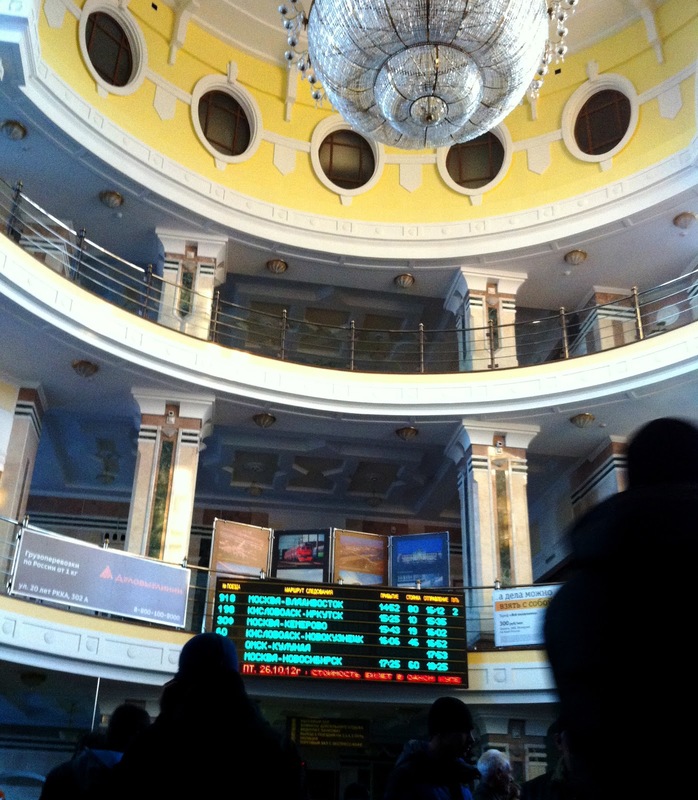 We caught the the night train out of Tobolsk, bound for Omsk. We didn't really plan on doing any sightseeing, it was just a necessary stopover. We did get to see one of Omsk's many Lenin statues, and might have accidentally got some photos of the Omsk railroad station (taking pictures of train stations is still considered espionage). Even in smaller towns the train stations are cool. There are lots of patriotic mosaics, interesting architectural details, or ornate chandeliers.